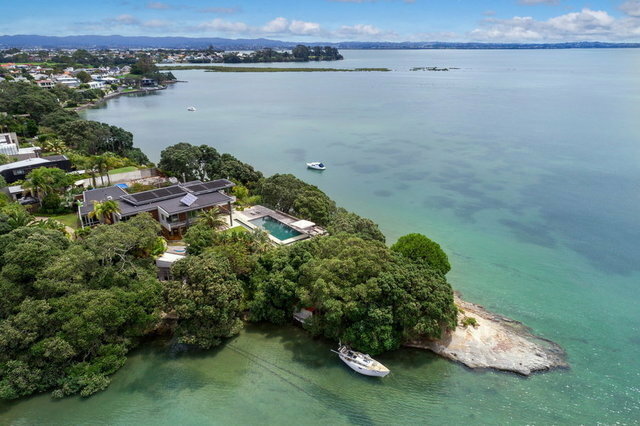 An unparalleled property occupying an exceedingly private peninsula surrounded by the glistening waters of the Waitemata Harbour. Enjoy glorious sunrises and sunsets in this spacious, luxury home that makes you feel permanently on vacation while only minutes from Auckland's city centre. Award winning architect Pete Bossley re-designed this uncompromised home to the highest standards. Advanced home automation and underfloor heating assure eco-friendly luxury and comfort all year round. 580 sqm of living space with stunning double height ceiling voids and spacious rooms flow to the lush subtropical garden, pool and substantial boat shed. Take your morning swim in the 13 metre solar heated pool, paddleboard or drive your Sea-Legs boat out of the boat house for a trip across the harbour or stay indoors and enjoy a cinema experience in your professional standard theatre with Dolby 5.1 sound and four metre screen. There is the added opportunity to purchase the adjacent 3 -4 bedroom home. On a separate waterfront title, also designed by Pete Bossley, this complimentary modern dwelling with lofty open plan kitchen and living area is suitable as a workspace, house relatives, staff and guests, generate additional income or sell at a later time. Located a quick 10 minute drive from Auckland's central business district, this is a property where you can truly relax and experience a great lifestyle. Private garden living on both sides, with outdoor room, wood burning fire and BBQ area. Savant Home Automation and audio/video distribution throughout. Solar heated pool with electric cover and expansive outdoor living. The Boat House: Two level, with recording studio / lounge above, and boat shed with ramp below to house your Sea-Legs boat, dinghies, paddleboards and kayaks. Additional smaller boat shed for more storage if required.